Hey SixPrizes. This is my 4th article in the last couple weeks, so apparently I’m writing at a pace like a Ninjask. In my last deck article, I started out by saying that I wasn’t confident the deck could win a States, and some people weren’t too enthusiastic about that. Well, this time I’m bringing you a deck I think has a real shot at taking a States. I’m going to be busy with school over the next few weeks and I won’t be getting a chance to play this at a tournament until Regionals in April, so I’ll just offer this idea to you and you can take it and run with it if you want. I drop it like it's hot. Unlike my last rogue deck, which I spent a couple weeks working out, this deck was thrown together the night before last Saturday for a friend to run at our Provincials. He wanted to use Chandelure NXD, so Starmetroid and I put together a list really quick. It wasn’t meant to be anything amazing, nor did I think it would do all too well, but it was a fun idea to test out. The deck ran Chandelure NXD, Ninetales HS, and a couple Victini NVI 15. The night before, I played a few matches against my friend’s ZekEels and we were about even in the five games we played. This really piqued my interest, but it was just too untested and I had already said my friend could be the one running it, so I didn’t spend much time on it after that. After Provincials, I went back to the deck because I really enjoyed the concept and my few games the night before had been really fun to play. Ninetales HS as a draw engine is just brilliant if you can dedicate two or three bench spots to it. There’s no better feeling than holding 20+ cards in your hand, playing what you want, then N’ing your opponent to one and knowing you can flip for Burned Tower for an energy to recover your hand, if you don’t just get an energy or draw support off the bat. I also drop it like it is hot. The main differences between my initial list and this one was the addition of Pokémon Communication and the removal of a second Victini NVI 15. I definitely enjoy Victini’s 100 damage output for cheap though. This deck has no energy acceleration, so it’s very important that the attackers can make efficient use of their energy. Thus why Chandelure works so well. 90 total damage for only one energy? Yes please. On top of that, with Level Ball capable of searching for Ninetales HS and extra Litwicks or Vulpixes or Victini, the deck could at least pull out what it needed after some straight draw. This lead to one of the strangest parts of building this deck for me, but first I’ll do some general card explanations. 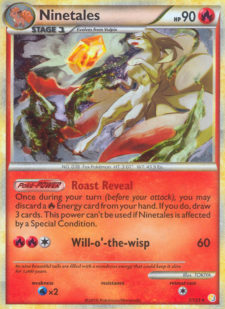 Ninetales HS: Ninetales is your draw engine. It’s searchable by Level Ball and can be set up by the second turn very easily with Litwick BW 27’s Call for Family. You’ll enjoy playing with your 10+ card hand thanks to Ninetales. I drop it like it is warm enough that I am uncomfortable holding it for extended periods of time. Lampent NXD: At first I was going to be using Lampent NVI for its Luring Light attack, but I changed my mind about Lampent NXD due to Durant. For the most part, you’ll just be Rare Candying into your Chandelures, so the Lampent line doesn’t see much action. However, when playing Durant, you can’t Roast Reveal through your deck to set yourself up. Lampent provides an attacker that can 1HKO Durant that is searchable by Level Ball and only takes two Energies to attack. I figured at first that Ninetales would provide me my Durant counter, but Crushing Hammer flips, Pokémon Catcher and rogue Rotom Plasma Arrows convinced me it wasn’t the optimal solution. Furthermore, Lampent NXD allows you to attack as the game progresses, and you can evolve it into Chandelure later when you get the chance. Chandelure NXD: A turn 2 Chandelure NXD is threatening. Tynamos and babies have to run in fear, and you get to set up KOs for the next turn. You can also 1HKO Celebi Prime while spreading to the Benched Pokémon. Flame Burst + Inferno also KOs all the genies (Tornadus EPO, Thundurus EPO, Landorus NVI) and can flip for Burn damage to KO any 130 HP Basic. The Burn damage is especially annoying against high-HP EXs that this deck would otherwise have trouble dealing with. EXs require a lot of resource investment, so it’s often annoying to retreat them manually to heal the Burn. This means they’ll stay in to be Burned and put into KO range of Inferno or Victini. In order to use me, you have to drop Basics like they're hot. 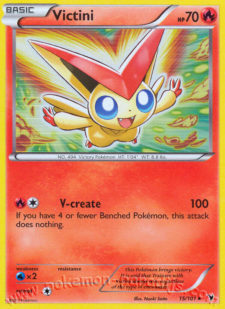 Victini NVI 15: Victini hits for 100 with V-Create when you have a full Bench. Chandelure spreads 30 damage. 100+30 is a magical combination that is hard to see fault in. And hey, it’s searchable by Level Ball. Furthermore, against EXs, Chandelure Infernos for 80 and burn, and Victini hits for 100 straight. Through those two turns, any EX, Eviolited or not, should be KO’d. Cheren: With how much you’ll be drawing with Ninetales, you want the option of further straight draw. You don’t want to shuffle your 10-card hand back just to search for a Rare Candy. You also can draw so efficiently that Cheren suffices whereas normally you would look to Sage’s Training for efficient straight draw. 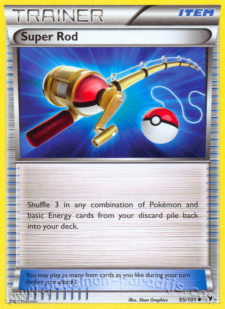 Professor Oak’s New Theory (PONT): Best shuffle-back Supporter in the format. With Ninetales HS, you can burn through your deck very quickly, so it’s good to have shuffle-back to prevent yourself from decking out. N: N performs the same role as PONT, but with the ability to disrupt your opponent. With Burned Tower and Ninetales, you can recover from your own one-to-three card N pretty easily in the late game. One game, I drew nine cards to finish off what was in my deck looking for an N and a Pokémon Catcher just to shuffle it back afterwards and N my opponent and myself to one card, only to do it again next turn. Ninetales and N have the same sort of synergy that Magnezone Prime and N have, but Ninetales is a bit easier to set up. I work because your deck has a BTU over 9000. Rare Candy: You want your Chandelure as soon as possible. Enough said. Level Ball: Four Pokémon in your deck aren’t searchable by Level Ball. This card is godly in this deck. Pokémon Communication: My original list didn’t run any Pokémon Communication, and ran four Level Balls. But sometimes you just need that Chandelure and you can’t draw into it. That’s why Communication is here. With 18 Pokémon in the deck, you can also make good use of it. Pokémon Catcher: Pokémon Catcher. It’s just too good. Even though this deck spreads its damage, Pokémon Catcher can provide disruption, allow for Celebi kills against CMT, and stick Terrakions or other high-retreat-cost Pokémon in the Active slot as you spread them to death. It also allows for Victini NVI 15 and Chandelure to KO what needs to be KO’d when it needs to be KO’d with their respective higher-base-damage attacks. 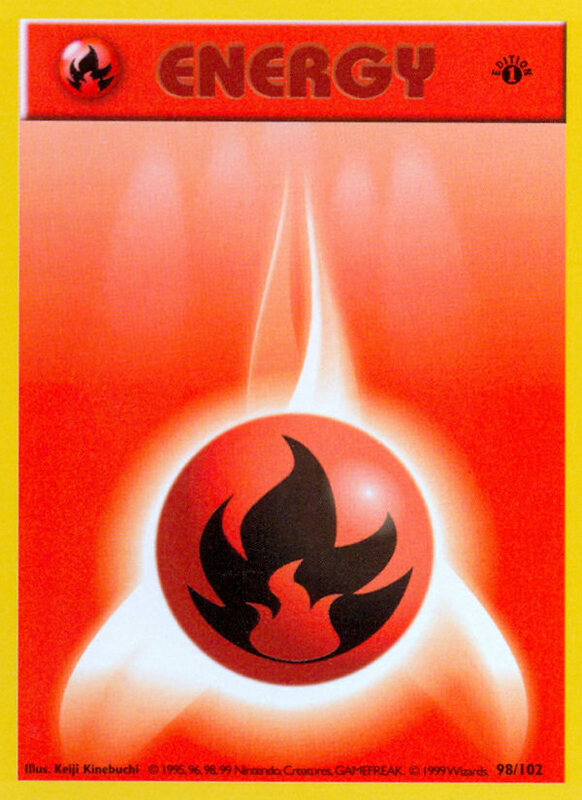 Energy Retrieval: With Ninetales, Energy Retrieval is like two Cherens. 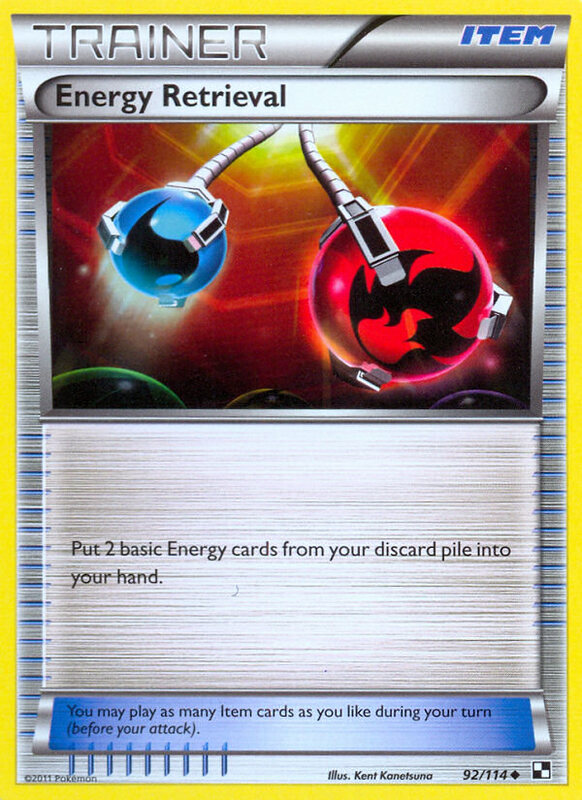 It also lets you get back the Energy you’ll be discarding so you can attach it that turn. Any deck without Energy acceleration really appreciates being able to attach an Energy per turn, and this deck is no exception. I let you drop it like it's hot. Burned Tower: Lets you get even more Energy back from the Discard. This also helps guarantee that after you N your hand back, you can recover with Ninetales. Finally, it discards Skyarrow Bridge. EXP Share: EXP Share is most useful for charging Victini NVI 15 or a Chandelure for Inferno in one turn, but is also helpful for preserving Energy when you want to draw with the Energy in your hand. Super Rod: You need to be streaming Chandelures fast. Rescue Energy helps with this, but with Super Rod, you can get back the important parts of your line based on what you have in your hand, and then search for them or just draw into them to keep up the pressure. If you’ve been unlucky with Burned Tower and have already used your Energy Retrievals, Super Rod provides just one more way of increasing the Fire Energy available to you in your deck. 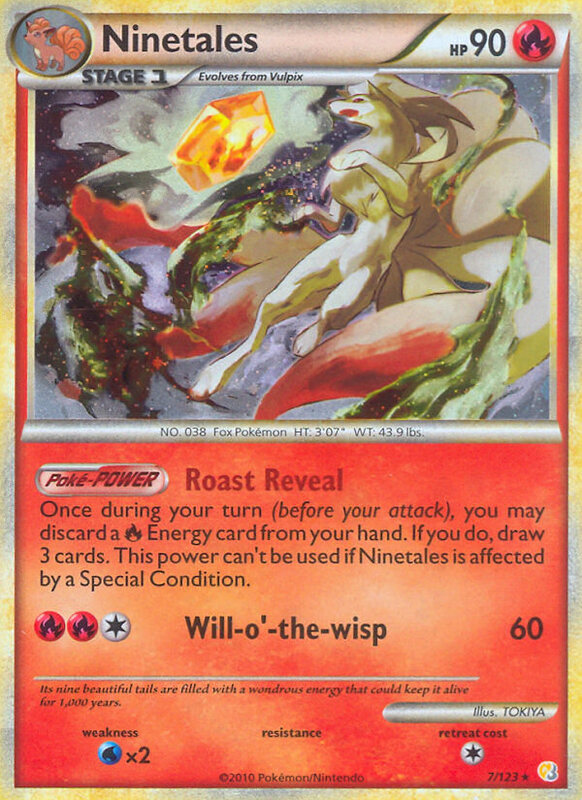 This can mean you can use Ninetales’ Roast Reveal to draw the cards you need, and feel okay that you’ll still be able to draw into Energy later. 1 Junk Arm: This is that strange part of building this deck I mentioned. I know. I know it’s crazy. Junk Arm is a card you run at least three of (often four) to increase consistency. But this deck just doesn’t need more. I let you return stuff you dropped as it is still too warm to hold on to. The big realization I came to as to why more Junk Arms just weren’t working for me was because of the Supporter line. I ran Cheren, N and Oaks. There are no Junipers, no Sages Training, just straight draw and shuffle. Ninetales provides further straight draw and I only have to discard Energies to do it. The fact of the matter is, the deck is at my fingertips. Junk Arm is used to access the card you need, when you need it. But with the amount of draw potential in this deck, you can already accomplish that! I nonetheless just feel comfortable having one in the deck. It means that if any of my Trainer lines weren’t enough for me that game, I can get one back. If you wanted, you could add a second Junk Arm in place of the Exp. Share, but I’ve found I enjoy the Exp. Share in a lot of my games. Rescue Energy: Chandelures. They’re important. Keep ‘em when you can. Fire Energy: Fire Energy is one of the most important parts of the deck. You get to drop it like it’s hot. I grab basics from the deck and drop them like I'm hot. As far as strategy goes, the deck is pretty simple. 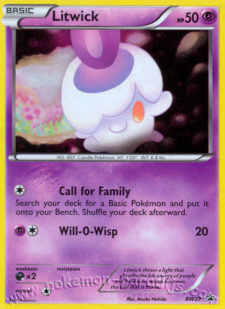 Promo Litwick is your ideal starter, but you might not always get one. That’s okay as long as you can get another Basic on your bench with a Level Ball or by just drawing into it. On your second turn, you’re going for a Chandelure, and to do that, it’s helpful to have a Ninetales. From there, just start spreading 30 and reply to threats appropriately. Chandelure NXD’s 120 HP is a bit disappointing, but with the format using Pokémon like Thundurus, Tornadus, Mewtwo EX and Zekrom EX as main attackers, Chandelure doesn’t have to worry about as many 1HKO’s that its NVI counterpart can handle. Zekrom BLW and Reshiram BLW are of course a big problem, but Zekrom BLW isn’t as annoying. Usually you’ll get a Chandelure attacking before they get Zekrom BLW attacking, meaning you can give it 30 damage. This means after a Bolt Strike it’s in Inferno range. Even without the extra 30 damage, after a Bolt Strike, Victini can revenge KO it. This is probably the biggest reason I play with Exp. Share in the deck. If you’re worried about this situation, Reshiram BLW is also KO’d by the combination of Flame Burst and Victini, and Victini really loves getting charged by Exp. Share. The only time you play the deck any differently is against Durant. This deck tries to draw very quickly to be consistent. Without the ability to do this, the matchup turns surprisingly unfavourable. This is why Lampent NXD made it into the deck. As I mentioned earlier, all you need to do to beat Durant is Level Ball for your Lampent and start Embering your way to victory. And if you get the chance, you can evolve and Flame Burst to spread damage and take multiple prizes per turn (which is hard to recover from for Durant). 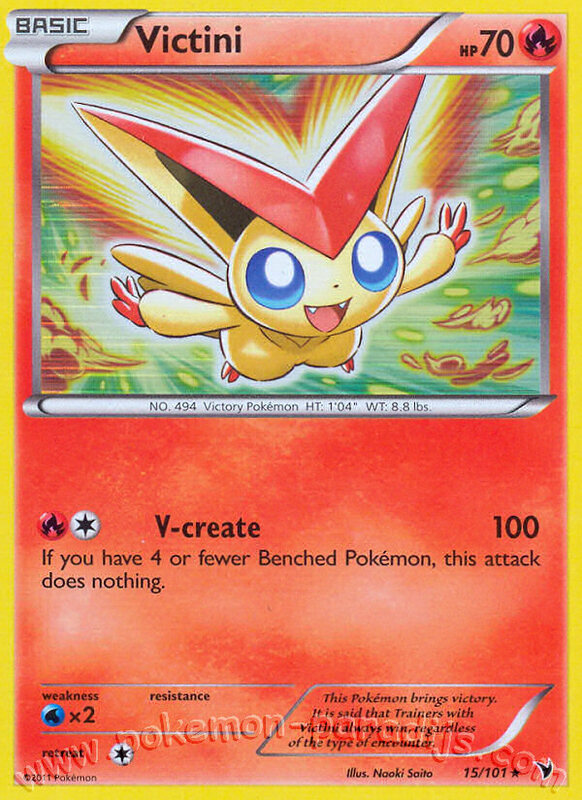 2nd Victini NVI 15: If you wanted to increase the damage output to the active, you could use an extra Victini. 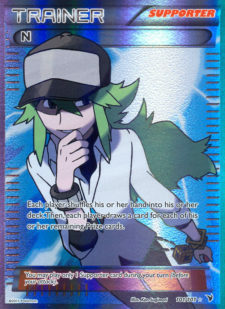 This guy is your worst starter in the deck though, so keep that in mind. Tyrogue: With Cleffa and 30 HP Tynamo ever prevalent, and all of your starters having one retreat cost, Tyrogue can earn you the turn 1 donk. Searchable by Level Ball and of course by Pokémon Communication, you shouldn’t have trouble grabbing it. Be wary about why you include Tyrogue though. Chandelure NXD already kills up to three Tynamos by the second turn, so Tyrogue is only useful on the first turn of the game. Chandelure NVI: This isn’t a tech I used in my testing, but people have seen this hit the field alongside Chandelure NXD. There was even a similar deck apparently run at Texas States, which focused on Chandelure NVI. The big advantage it offers is to place 30 damage as you please before spreading 30 everywhere. This can mean hitting one benched Pokémon for 30, another for 40, and another for 50 by the end of the turn. I was pretty surprised, but there’s more than one way to skin a Purloin. Watch for this card in the future. Mewtwo EX: Hurp durr I’m a put Mewtwo EX in my deck and it’ll be good! But seriously, if you wanted to run two DCE instead of the Rescue Energies and play around with your Trainer lines a little, Mewtwo can help win you the Mewtwo war. You can also use Mewtwo over Victini and have him charged with Exp. Share. Pichu HS: A way to fill your bench on the first turn? Yes please! Granted, you let your opponent do the same, but if you went first, that’s a very dangerous move for a ZekEels player to make. I strongly recommend trying Pichu as a tech. I grab you Basics that are Fire-type and therefore hot, thus I release them from my grasp abruptly. This section of the article was added last-minute, but it was too important to talk about to leave it out of the mix. There were a couple similar lists (Chandelure/Ninetales) run at the Texas States Championships. Now, neither deck made Top 16 (though a ReshiBoar running Chandelure NXD tech did), but one did at least have a fair record (started the day 3-1, I don’t know it’s final placing). 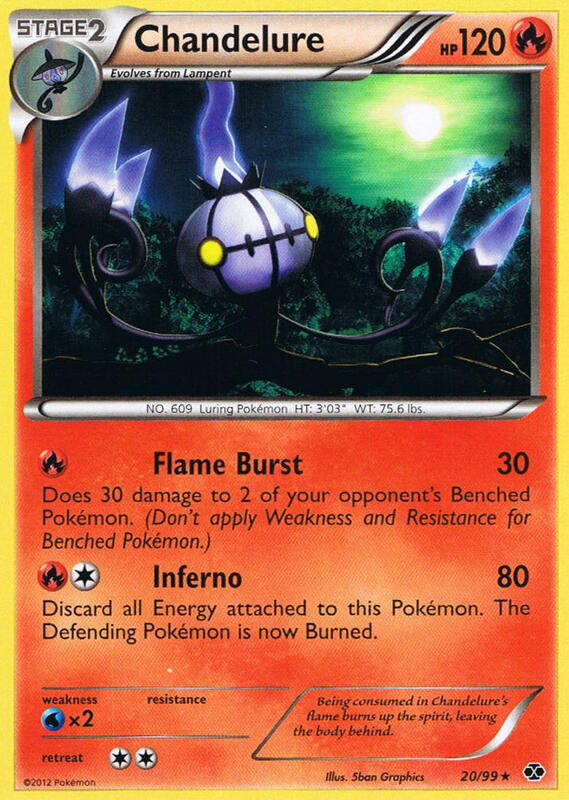 The deck focused on Chandelure NVI to start as your main active Pokémon, and used excess Switch to abuse Chandelure’s ability. Chandelure NXD would then come in and spread 30 three ways for an effective finisher. I have to say I like my list/playstyle more, as a Cursed Shadow is nowhere near as effective as just going for a Flame Burst, but I can definitely see positives in running an even mix of Chandelures (i.e. HP, efficient snipe). If this deck sees any more play or any success at a States, I may just have to test it more extensively and come up with a proper deck article looking at a general skeleton list and filling it in with different options. Expect this versatile rogue to see at least some play out there, as I wasn’t the only one who had this idea it seems. Good to know that at least my list hit the scene at the same time as the first lists of others though. I feel like a proud papa. You're not the only deck that's too hot to handle. This deck just plays very quickly and deals high total damage for very little Energy. That’s practically the recipe for any successful deck. It also has good matchups against the top three decks in the current format. From further testing (I didn’t keep track of the games) it plays about on par with ZekEels and has at least an even matchup against CMT (if not better). 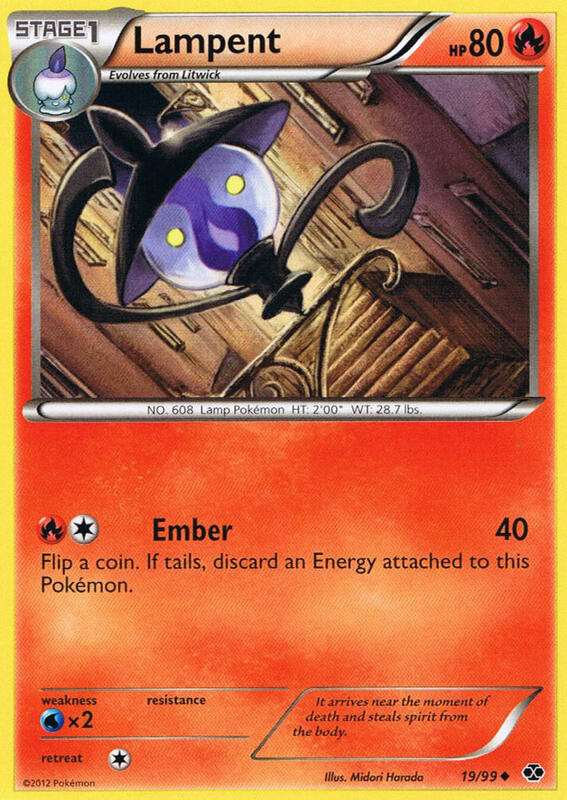 Mewtwo becomes ineffective when Chandelure gets to discard its Energy as it attacks. Burn damage also gets through the Eviolite, which was a problem I’ve had with spread decks in the past. Chandelure’s 120 HP is also more than enough to deal with Tornadus. Durant is practically an auto-win, even moreso than ReshiPhlosion. Mono Terrakion NVI is also a favourable matchup, though the combination of Retaliate and Land Crush can be an annoying 2HKO. However, the ability to spread damage and kill Terrakions with Inferno makes it difficult for Mono Terrakion to come out on top. ReshiPhlosion is probably the deck that would give you the most grief, since it streams Reshirams and has high-HP Energy accelerators. But it’s not as strong a play at the moment. There you have it. I’d love to hear feedback on the deck, and if you build it, how you felt playing it. This deck I genuinely feel has a chance to win a tournament. It already has solid matchups against the top tier decks in the metagame, but with rogue factor included, you should hopefully have the advantage. On top of that, it’s named “Drop It Like It’s Hot.” And as I mentioned last time, a deck needs a good name to win a tournament. The caption under Pichu was more than enough to get a Like from me. Why not add a reshiram ex. Wow, this article was umm… different. I can see your thought process behind the deck and I like the way your math adds up (enough to justify it’s play-ability against the current meta decks). However I’m not too sold on the matchups (particularly Zeels and CMT). 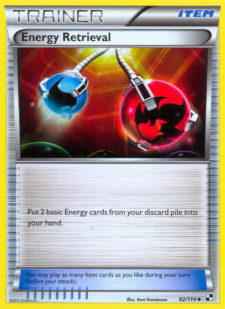 Everything in the deck baring Chandy, is “one-shottable” to: Mewtwo and the Genies, especially early game. None-the-less, very well written article, and Kudo’s on the deck idea! This comment is among the most annoying I’ve ever read. No energy accel makes Reshiram EX a sad panda. Even with DCE, after one bad flip on Brave Fire is all it takes to make Reshiram a 1 for 2 prize trade. This would make Reshi only really good for Glinting Claw (as it can be charged quickly), but then you’re stuck dealing a paltry 50 damage some turns. But feel free to throw it in and see how it goes. I didn’t expect it to be all that great, but I was decently surprised. If I were to analogize it to a more current played deck, it’s like a Stage 1’s Rush, but you’re using Stage 2’s. That sounds like a bad idea, but you can stream them quick enough that it just works. You definitely have to keep up the pressure or you’ll just fall behind.That said, the only Pokemon you really want in the active slot at the end of your turn is a Chandelure, so the rest of the deck being one-shottable isn’t as big a problem. Regenerating stage 2 attackers seems like a big issue. But if they’re killing Chandelures, that means your Ninetales are safe. If your Ninetales are safe, you have draw power. If you have draw power, you have Chandelures. That’s about what it sums up to, and why the idea is viable. I definitely agree though. When I first saw Chandelure NXD I dismissed it entirely due to the 120 HP. But though the format has 120 damaging attacks, it’s shifted a bit. ZekEels has 1-2 Zekrom BW’s in it, but now it’s running Thundurus, Zebstrika, Zapdos, Zekrom EX and Mewtwo. Chandelure NXD could care less about every one of those attackers (at least compared to Chandelure NVI). And I love MeesieMew. I’ve tested it quite a bit and almost ran it for states, but ended up letting a friend take the wheel. But faster is another question. This deck has plenty of speed and a T2 Chandelure w/ Ninetales and at least another Litwick and Vulpix on the bench is a more than accomplishable task. Last, Burned Tower. Only reason I dropped the second is Flippiness. I played around with only having 1 Energy Retrieval and 2 Burned Tower, but it just wasn’t there when I needed it. Thanks for the awesome article! I’ve gone back and tried Chandelure/Vanilluxe NDE based on the Underground article posted the other day… I tested it a few games, and it works well, but I can definitely see the advantage of the draw support (I run a fun water deck using Delibird–more like “13 cards in my hand at all times” the card). I will need to get my hands on some Ninetales and try this. I enjoy playing cards and decks that can be searched with Level Ball. There’s a lot of power that can be found in a speedy setup with these little guys. I’m glad you gave Chandelure NDE a try and made it work. Again, I’m going to try this when I can–looks like a fun alternative to Chandelure/Vanilluxe! And seriously test Pichu. I haven’t tested it much, which is why I didn’t put it in the main decklist, but against ZekEels, you can probably net a couple Tynamo kills the second turn. A 3rd catcher in the deck might help for a 3-Tynamo kill T3 as well. Against CMT, you can catcher a Celebi for the KO and spread to two more pokemon (maybe Celebis). Then next turn KO another two Celebis and hit the active. Decks need energy accel, but it’s more fragile than all the other cards in the deck. Chandy NXD is looking for quick cheap prizes. I’m almost positive this deck does not have even matchups with the big decks. Yes, agreed. I can actually see the use of Pichu in this deck for what you said… Plus it can near guarantee a perfect setup for yourself. And of course I would respect your decklist name! Haha. Try it. It might not, but looks can be deceiving. I didn’t post any ratios because as I’ve mentioned, I just haven’t had enough time to test it, but it’s speed can be crippling. In my games, I felt they were split pretty even, but I admittedly didn’t keep track. Guess I’ll have to test it. The format is pretty un-fun right now when Zek/Eels and Mewtwo/Celebi destroys most every other deck. Cool deck (and nice article), but I feel like the list could use some adjustments. It might be a bit low on energy recovery. Not sure about just 1 Junk Arm, but Ninetales draws cards like a monster so it might actually suffice. If anything, I’d include that Pichu I was talking about. I only played a few games with it, but it’s just such a tempting idea. I almost regret not putting it directly into the list. Oh, yeah, forgot about Super Rod. So take off all your tools. Also yeah, Ninetales does draw cards like a monster. It was really weird for me to put only 1 Junk Arm in. The original list had none because it was built on a budget, but then when I tried to add them they just took up space in my hand, and I found myself missing the cards I took out. I do like one though, just so you can get that 3rd catcher or energy retrieval, or an extra super rod or Exp. Share. hmm, defenders seem like a useful tech against zekrom and reshiram. everyone has kind of forgotten the old ways of defending against them since eviolite came out. Try it out. As I said, I didn’t think it would be very good either, but it’s just efficient, consistent, and survives by taking cheap prizes. And if they don’t offer cheap prizes (energy accelerators), it can outspeed them and win that way. I know… 120 HP stage 2 seems terrible… but the metagame has shifted and 120 isn’t as much of a magic number anymore (It still is, but it’s not as important when you look at all the matchups you’ll face). But the most popular decks right now have basic attackers that can fairly consistently OHKO Chandy (Zekrom, Mewtwo, etc.) and you don’t have a counter to any of them. Trading stage 2’s attackers with basic attackers is never a good idea and it means you’re going to run out of resources to keep attackers going before they do. I’m not even going to get into how the sheer speed of these decks that would rip this apart under normal circumstances, let alone with the fact that you don’t even run collector. I actually constructed this deck last night (with some minor adjustments) using only 10 fire energy, 2 retrievals, and a burned tower. I always had enough energy to attack and only had like 2 energy in my discard. Just how big a threat is Zekrom BW? Especially without energy accel? If you only have to face 1 in a match, you can get around it (especially thanks to Bolt Strike’s self-damage). I’d add, Collector isn’t near essential. Play the deck. Consistent T2 Chandelure. Level Ball (and especially Pichu) and Ninetales make it happen. Very curious to hear the result. I tried a lower fire count, but maybe I just had some bad luck games. Dropping a fire is the first thing I did when I was looking to add room. How does it hold up matchwise? I only played against my boyfriend’s deck (he’s running a pretty cool 6 Corners like deck with the birds, musketeers, and Klingklang), and it did pretty well. Even though I had most of the deck in my hand, I still had some trouble getting stuff when I needed it… I wasn’t running Victini either, but definitely think I will be adding him. Having spike damage would have been helpful against his Articuno. 8| Pichu is awesome for this deck, and Ninetales is great. I’m thinking of splitting the Chandelures (P/F 50/50) and adding Dodrio. I don’t know how it will do, but it’s just an idea. Ninetales is AWESOME for this deck, and it comes out pretty darn fast. I might take it tomorrow to States depending on what I do to it tonight. I think the Lampent was the best caption, honestly. You know what would be nice? Moar Monferno cards. A lot more. Let’s get an Infernape EX up in here, with another holo Infernape version, thus making two new Monfernos, plus their RH versions…swoooon! I’m not convinced on the deck itself but I think the picture captions got you this rating. Well… I can definitely say the deck isn’t bad*. I’d say it definitely at least competes at tier 2 level. And as I’ve outlined in the comments and the article numerous times now, you’ve got a pretty good CMT matchup, and at least can deprive ZekEels of energy accel with a T2 Chandelure. Durant is an auto-win and Mono-Terrakion is somewhat favourable. Those 4 matchups alone determine how you’ll do at a tournament, and given those, things look promising to say the least. I guess so. I wasn’t trying to say the deck was bad but it is so different. I would like to know how this deck performs in tournaments especially without Collector. Also, not all Zekeels play the 30 HP Tynamo. In fact, I think the 40 HP Tynamo is better because people are looking to counter 30 HP tynamo with Tyrogue and (Drop it like it’s hot) Chandelure. I see that Durant is auto-win, but not with Lampent. I would just do Ninetales because Lampent can discard energy with it’s attack which helps Durant and a Durant with Eviolite survives an Ember. That is the primary fault you made while building this deck. It is a good article though and w/out the picture captions deserves IMO like a +12. IDK why the picture captions are so appealing even though they are kinda funny. Kudos for the article though. Mewtwo can by loading energy on, is what I was trying to say, not that it was easy but that it is possible. Imply people don’t play revive and/or super rod as well is just stupid. I don’t know how you can say Collector isn’t essential. Not having collector means you can’t bench multiple basics in order to ensure at least one survives. Pichu helps decks like Eel and XTC set up way more than you’d like to. Get 5 energy on Mewtwo and we’ll talk. Chandelure 1HKO’s Tynamos (and the benched Tynamos) and Celebis (while setting up the KO for next turn on the other Celebis). It is possible, but Mewtwo will be without support at that point, and you can just KO it and leave your opponent without Celebis and a dead Mewtwo. Sure, they’re setting up in-between, but you’re just dealing with too much theorymon for me to really respond to concretely. Bring it Revive your Zekrom without energy accel and see what happens. Just saying. Also, only Tom Hall’s list ran Super Rod in that article. I know people do run Revive (especially for the Mewtwo war) but in ZekEels, Revive is the 61st card. Super Rod is too, but people find room for it. And if you’re still harping on Collector, and you think Pichu helps your opponent more than you, then I can tell you haven’t played the deck. I know you’re a solid player. You’ve got 11 CP on the season and you’re doin alright. But I’ve played the deck and I’m telling you that it’s not as black and white as you seem to think. Well whatever, we can argue back and forth all day but it won’t accomplish anything. Are you going to be at western Canada regionals? Let’s just play a few games then and see how it goes. Also wut? I have 11CP? I could have sworn I only had 7 hahaha. I guess the kicker was worth more than I thought. Haha, yeah. I can’t say for sure I’d run this at Regionals. That’s a month away and a lot can change in that time. But if nothing more, I’ll probably at least play it at a Battle Roads. :P I am confident enough to run this, but as a choice for regionals… that’s got to come down to what I think will give me the best chance at a win. Did you play at the AB provincials? My friend ended up taking 1st there. As silly as this sounds, Ninetales is too frail. With Durants teching Mewtwo’s and DCE’s they can come in and just 1HKO Ninetales. Even a Rotom w/ Prism does 60 to ninetales, meaning Durant can vicegrip for KO. Then you’re left trying to set up another Ninetales, without drawing through your deck. It’s tough! 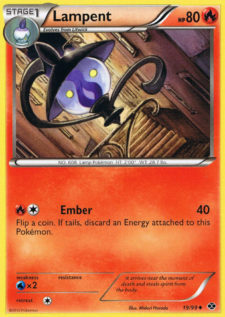 It’s true that Lampent NXD can discard energy, but the deck does a good job of getting it back, and as I mentioned, you can just evolve to Chandelure. Eviolite is annoying, but try playing both matchups. I’d say against Durant it’s situational and you sorta just go for what you can, but Lampent is easier than ninetales and assures the late-game better. And I was considering dropping the picture captions, but they were too cool ;) IS THAT LIKE A TRIPLE ENTENDRE!? I just meant for fun to the side at some point. Yeah. I played meesiemew, went 4-2, and bubbled cut at 10th. I am definitely down to play some games pre-tournament or something! :D Though my friend might try using the deck on the day of. Without ever playing the deck prior to the day at BC provincials, he went 3-3 with it. To give an idea about his skill set… he made a Regigigas EX, Chandelure NXD, Vanilluxe NXD, Reshiram EX and Moltres deck… It didn’t go well…So 3-3 was pretty good for a deck he’d never played before! It wasn’t even using Pichu at that point! Did you end up running the deck at States? i went 5-3! so not to bad. i lost to a turn 2 disconnect, and a turn 2 vileplume… nothing i really could have done there, trainer lock completely locks you out of rare candy. I also lost to a durant, but i got a lone mewtwo ex start so it was catcher bait all game. 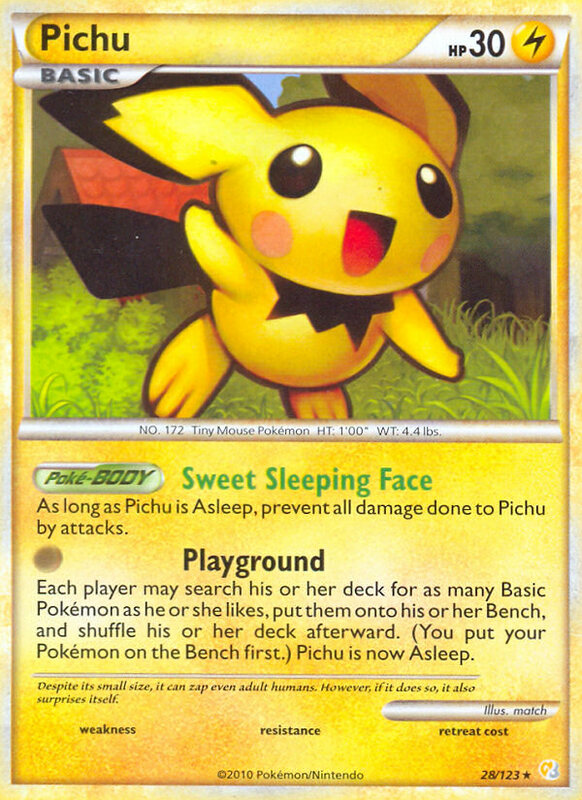 Also, pichu is amazing in this deck. I started off running one, but it was so integral to the deck’s success that i upped it to two. I also dropped the fire energy count by 1, and dropped the rescue energies for a mewtwo ex, a dce and a twins. Oof. Yeah, Zebstrika is harsh. Turn 2 Vileplume is the same : And you ran Mewtwo in your list eh? How helpful was Mewtwo would you say? I mean, he turned into a major liability during your Durant game, but in your other games did he make a big impact? but actually it helped a lot. i could usually take out one mewtwo ex with a combination of v-create and inferno, and then my opponents would start attacking with another one thinking they had the game. with so much draw power though i had usually drawn into a dce and my mewtwo by then, and i won a couple of games by killing mewtwo for my last prize. I know right. It’s like… thanks for the free prizes :P Thanks for the mini-report! I’m just overall very curious to hear about how things go with this deck. I was hoping it might make top cut somewhere, giving me an excuse to write up a full article and justify testing it more extensively (since I’m busy with school). But without results I don’t know if people would really care too much. Sometime in the future though, I’ll probably at least finish my time with the deck by writing a skeleton list article, and then give multiple decklists running different tech options/playstyles. But that’ll probably have to wait until it does something at a Regionals or maybe Battle Roads. Due to a bout of Insomnia, i’ve decided to record myself dropping hot things onto other players. Just a few matches so far, but i’ll be toying with the deck a bunch. Would be pretty good combo’d with Inferno. And of course it’s got Bright Look. Once that comes out though, Amoonguss NXD is gonna need a looking over again to see if it can work. I just realized, I never met you! We totally should have played a game! How’d you do anyways? Sorry to hear that. How many Mewtwo did you lose?